Increase the throttle response in your vehicle by 25% compared to the stock configuration. Making your Vehicle much more quicker and responsive! It is the quickest and easiest installation to improve your vehicle's acceleration! Faster overtaking, better response uphill, and improved response in downshifting. Resulting in a more fun experience on the road! Automobiles in the 21st century have replaced the more conventional throttle cable technology for an ECM (Electronic Control Module) that translates pedal travel into electronic signals in order to provide power to the wheels. The ETC system (Electronic Throttle Control) - also known as drive by wire- has the unfortunate downside of delayed throttle response and subdued acceleration, creating problems in certain circumstances such as up-hill starts, quick gear changes, overtaking, ect. The Sprint Booster aims to overcome this throttle response delay for ETC-equipped vehicles, providing crisp on-tap acceleration at the driver's disposal. It is a design that improves acceleration by continuously measuring and converting the digital signal provided by the ETC's potentiometer, and providing the ECM with a new and altered signal. The ultra compact design allows the driver to place the selector switch anywhere on the dashboard according his personal preference and convenience. 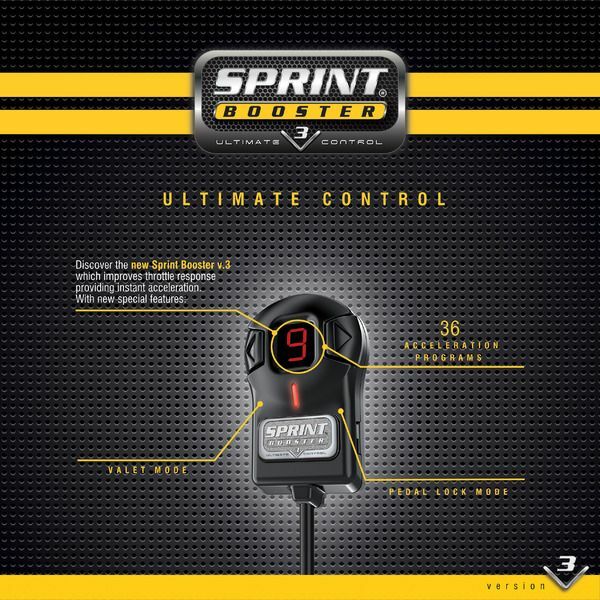 "I was probably the biggest skeptic out there for this product, until I saw a demonstartion on how the Sprint Booster actually changed the gas pedal's opening rate. It was the eye opening to think that the throttle wasn't opening fully when I hit the accelerator, so I installed it on my Mercedes C63 to see what it could do, it works the same in all modern vehicles with an electronic throttle. First off, the install was dead simple, the only snag was it was a little hard to get to, so it took about 25-30 minutes. I had the button installed under the steering wheel for a stealthy appearance inside. I turned on the car, changed the setting on the Sprint Booster and O M - the car at the full throttle setting was an absolute monster off the line, for sure- it was quicker on the 0-60. This wasn't like doing a Tune where I had to datalog or fiddle with maps- it just worked. And I could turn it off just as easy. Basically, it eliminated the lag in the throttle response when you step on the gas, I was impressed, and I was hooked on that instant power. After a few weeks, I realized somethign else about the Sprint Booster. While it was on, when I would just be driving normally and needed to overtake a car, I could still tap into the power quickly with no lag- even while in "normal" driving mode. Because I wanted to get more than a month out of this set of Michelin Pilot Super Sport Tires (on a 450+HP C63 AMG), I didn't do many launches, but overtaking and instant power was incredible, hands down, the biggest benefit I personally felt with the Sprint Booster. If the C63 AMG fell short of my expectation the explosive power delivery I saw the C63 on Top Gear, with the Sprint Booster, it finally felt like the beast it's supposed to be.